Setting your thermostat properly is essential to ensuring that the heating and cooling systems in your home work as they should. Your Honeywell digital thermostat has a series of on-screen tools that enable you to set the thermostat's clock, fan and general system settings. How you go about performing these procedures varies slightly depending on which part of the thermostat you want to reset. 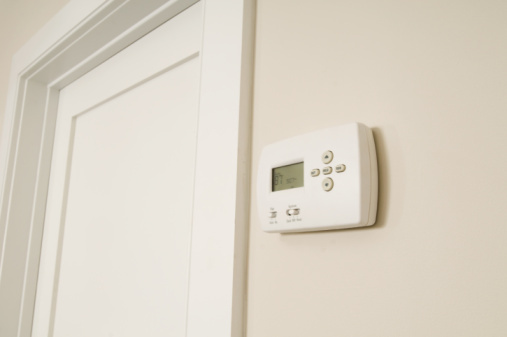 Press the virtual "Clock" button located along the bottom edge of the thermostat's screen. Press the "Up" and "Down" buttons to manipulate the time displayed on the screen. Press and hold either button to change the numbers more quickly. Press "Done" to save your changes and exit the Clock screen. Press the "Fan" button in the upper left corner of the thermostat's main screen to open the fan settings screen. Select the fan settings you want to apply. Press "On" to turn the fan on permanently. Press "Auto" to set the fan so it runs only when the heating or cooling system engages. Press "Circ" to set the fan to run randomly. Press "Done" to save changes to the fan settings. Press the "System" button to load the system settings screen. Select the system settings you want to change. Press "Heat" to set the thermostat to control only the heating system. Press "Cool" to set the thermostat to control only the cooling system. Press "Off" to turn off both the heating and cooling systems. Press "Auto" to set the thermostat to automatically select whether it controls the heating or cooling system depending on the interior temperature of the building. Press "Em Heat" to set the thermostat to control emergency and auxiliary heat. Press "Done" to save your changes to the thermostat's system settings.